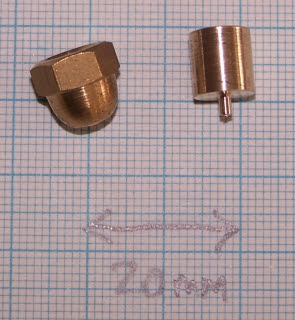 Since I rebuilt my extruder with an acorn nut shaped to a point with a conical outlet hole I get much worse performance than my old one piece nozzle. I was thinking of doing pretty much what you have done. I think the end of the nozzle should be about three times the filament width. The hole should not be too shallow either. Making it shallower reduces the extrusion pressure and the die swell but also makes the extruder more incontinent. With a conical hole such that the edge is only about 0.1mm thick the extruder overrun is about 40mm! Presumably your hole is as long as the nose, or is it opened out behind? Have you noticed a change in the overrun? Regarding cleaning the brush, I find any bits that get stuck get knocked off on subsequent wipes so you probably just need a little pot underneath to catch the dross. Wacky idea: What about the tip from a mechanical pencil? They're roughly the same shape and usually have a 0.5mm diameter. Might be a bit too delicate, though. To clean the toothbrush, just forget about it. All you have to do is print a new one and recycle the old. viola! Presumably you'd want a clean brush at the start of each printing job, right? 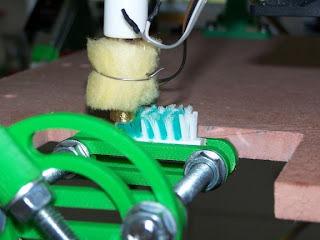 Also, making a toothbrush takes some work with staples and a polishing wheel, in addition to the plastic molding. It might be worthwhile to learn how to reuse one. Might help to spray an incompatible oil (maybe silicon or teflon?) onto the toothbrush. Something to keep the polymer from sticking then when it cools successive passes would flake it off.